Situ Patenggang is a tourist attraction in South Bandung in the form of a lake. 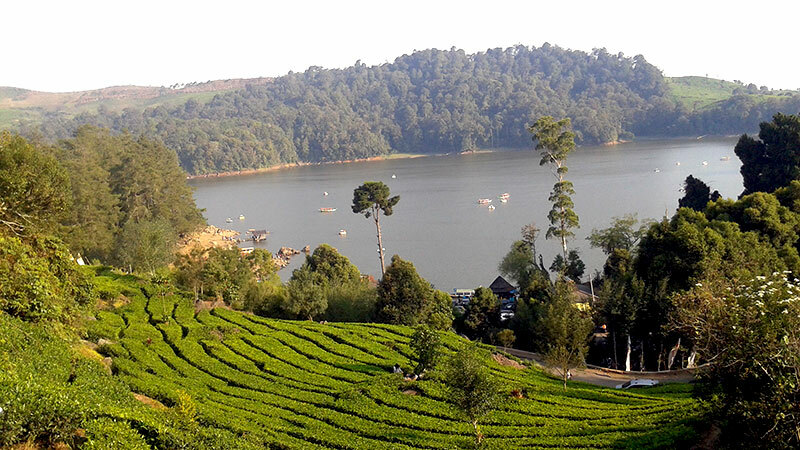 The lake is located at an altitude of more than 1,600 meters above sea level has a beautiful scenery and cool with tea plantations in the vicinity. The lake, which has an area of approximately 45,000 hectares, is part of a nature reserve that has an area of more than 123,000 hectares. The name Situ Patenggang comes from Sundanese ie 'situ' which means lake, and 'pateangan-teangan' meaning to seek each other. There is a myth about Situ Patenggang which tells about the love of Ki Santang and Dewi Rengganis which separated for a very long time. Because of their deep love, they both searched each other until finally meeting in what is now called the 'Love Stones'. After meeting again, Dewi Rengganis asked to make lake and boat so they can sail together. Currently, the boat is considered to have turned into a heart-shaped island called Asmara Island or often called Pulau Sasaka. According to local folklore, couples who come to love stones and go around the island of romance will have an eternal love. The lake is located close to Kawah Putih at Situ Patenggang Street an can be reached with a long journey about 2 hours from the city of Bandung. Usually tourists will visit both these places at once because only about 10 minutes. To reach the most famous lake in Bandung you can use a private vehicle with a travel route from Jakarta using toll to Bandung and then out of the toll booth Kopo and leads to: Soreang - Ciwidey - Situ Patenggang. If you want to use public transport then you can take public transportation from Terminal Leuwi Panjang Bandung to Ciwidey Terminal. After arriving at the Ciwidey Terminal, you can use an angkot that leads to Situ Patenggang. The price may change depending on the time of the visit (weekend or working day) and bargaining activity.